You say “to-MAY-to”…I say “to-MAH-to”!! Part Three | eat. cook. blog. Part Three in the “You say “to-MAY-to”…I say “to-MAH-to” series. 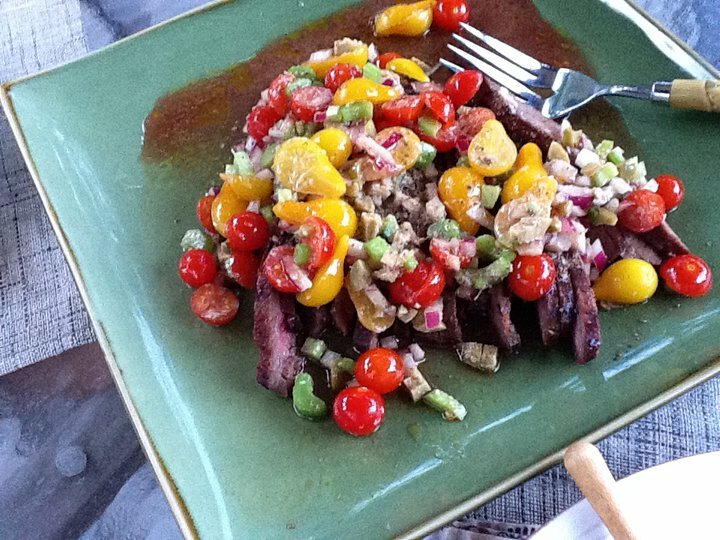 Another great use for those delicious summer cherry or grape tomatoes. I found this recipe at Smitten Kitchen last year. I was immediately attracted to the recipe because, well, I love me a Bloody Mary cocktail. And what could be better than a steak and a Bloody Mary? It’s funny because SK writes that the recipe was adapted from Bon Appétit which, as you know if you read my “About” page, is where I get most of my recipes…great minds think alike (but how did I miss it in BA?) The recipe calls for skirt steak. SK says that she used flank steak and that both cuts are interchangeable. When I went to the butcher and asked for skirt or flank, they recommended a hanger steak, so that’s what I used. Prepare steaks: Arrange steaks on large rimmed sheet or cutting board. Mix 1 teaspoon Kosher salt, dark brown sugar, paprika, cayenne and freshly ground black pepper together in a dish. Rub all over steaks and let them marinate in this rub for 1 to 3 hours, covered in the refrigerator. Remove steaks from fridge 1 hour before you’re ready to cook them, to bring them to room temperature. Prepare salad: Pour 1 tablespoon sherry vinegar over onions in the bottom of a large bowl and let them sit for 10 minutes, stirring occasionally. This will temper the onion’s bite. Add tomatoes, celery and olives. Whisk remaining 2 tablespoons vinegar, reserved olive brine, horseradish, Worcestershire, pepper sauce and celery seeds in a medium bowl. Slowly drizzle in oil, whisking constantly until combined. Add to tomato salad and toss to coat. Season with salt and pepper to taste. Set aside until needed, and up to 4 hours in advance, if covered and refrigerated. Cook steaks: Preheat a charcoal grill to medium-high or a gas grill to the highest heat. Brush grill grates with oil. Grill steaks for about 4 to 5 minutes on each side for medium-rare. Let rest for 10 minutes before slicing into 1/4-inch thick slices, against the grain. Alternately, cook the steaks inside: Heat a large cast-iron skillet on medium-high to high and coat bottom with oil. When oil begins to shimmer, place steak in skillet and do not move it for 5 minutes. Turn it once, and cook for another 3 minutes for medium-rare. Repeat with second steak. If your steaks are too large to cook in one piece, you may halve them to fit. Let rest for 10 minutes before slicing into 1/4-inch thick slices, against the grain.